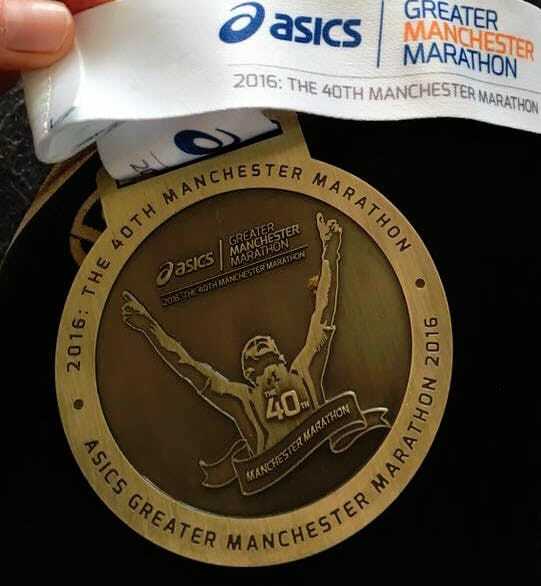 The ASICS Greater Manchester Marathon was held on the 10th April 2016 in Manchester, England. It was my first marathon, and I finished it in 3:08:23. My training had sadly been erratic at best. On the 30th March I had completed my final long run (20 miles). I ran this because I had been ill (with a virus) for the final 3 weeks of my training. I wanted to verify that I was completely over the virus, and that I could still complete long distances. Had I not been able to complete this run I would not have run the race. The downside of this was that I was a little less rested for the race than I would have liked. Missing the 3 weeks of prior training also meant that I was not as well trained as I would have liked. I essentially had a policy that if I was too tired for a particular run I wouldn't do it, and if I couldn't do a run (for whatever reason) I would just do it the next day. Occasionally I would go for a swim instead which was normally just an hour of front crawl lengths. Generally I was training in some capacity at least five days a week. At the start of my training I had been going to the weights room once a week but I found this to be boring so I stopped. This was most probably the worst aspect of my race preparation. In the week prior to the race I binged on cereal, oats and carbs (more generally). I am not talking a bowl of cereal but rather boxes of cereal. I justified it to myself as carb loading but it wasn't intentional. This was an extension of my ridiculous eating habits (problem) whereby I eat well during the week and then binge on awful processed carbs at the weekend. Fortunately for me, a good friend of mine lives in Manchester. Not only does he live in Manchester, but he lives on the first bend of the marathon route. Even more fortunately for me, he was away on holiday and as such I was able to sleep in his comfortable double bed. I went to bed ridiculously early (around 9pm) which meant that even though I had difficulty getting to sleep I still felt well rested when I awoke at 6am the following morning. The day before the race I was able to control my eating. I intentionally ate carbs - oatmeal for breakfast, pasta salad, cous cous and sweet potato for dinner. I made sure to not eat after 8pm and I avoided dairy. On the morning of the race I had a large bowl of oatmeal with some mixed fruit, a banana, and a breakfast bar I picked up at the race village. I did not warm up. I tend to not warm up (which I accept may be foolish), but having been on my feet quite a bit the day before and having been on my feet a number of hours pre-race I felt ready on the start line. Having never run a marathon, I knew that the distance was going to be the main consideration. That said, I did not want to be overly cautious and feel like I had left something on the table. My best half marathon time suggested that I 'could' run sub-3 and so I opted to simply follow the 3-hour pacer, ignore my watch, and stick with him. There was no Plan B - my attitude was/is that pre-planning a Plan B is planning for failure. In training a barely ever run anywhere near race pace (6:53 min/mile). For the first half of the race the pace was not much of an issue. I tried to keep just ahead of the pacer so as to avoid the massive block of people following religiously behind. The main issue was the water/gel stations where the number of people meant significant slow downs/stepping on peoples heels in pursuit of a sip of water. I lost my flow a little at each station. Coming up to the half way mark there is somewhat of a hill. This was pretty tough. At this point I was concerned about having to do another 13.1 miles. After the half way point I dropped off the pacer. I couldn't keep in front of him, and the number of people behind him meant that you had to mentally focus on where you were stepping rather than just running. I was concerned about even finishing so I didn't try to push myself to keep up with the pacer as he slowly moved ahead. During these 6 miles I noticeably felt my speed drop off. Looking at the end result, and my splits it would seem that I did not slow as much as I had thought. That said it did feel slow, and it was mentally extremely tough. At this point my legs were hurting. It was ego and stubbornness that was keeping me going. This was the mental part of the race. Others were dropping like flies - people walking, people falling etc. When other people are stopping it seems reasonable to do so too. The organisation of the race was also extremely poor - mile markers were at incorrect distances, and there were two 22 mile markers. Mental discouragement when already discouraged is really tough. For the first time in the race I looked at my watch. My thought process was that if I were a few seconds off some milestone I would be able to find that little bit extra. I did increase the pace but at the point that I could see the finish line I felt my right leg cramping up. I figured that it was way more important to finish the race than for my leg to crumble 50 metres from the finish line. I am extremely proud that I finished, and whilst I didn't get a sub-3 time I was extremely happy with my time especially given the fact that it was my first marathon. Everyone always says that you should respect the distance. I certainly agree with that sentiment. The marathon was physically challenging but more so it was mentally challenging. I don't find myself wanting to rush back into doing another one anytime soon. 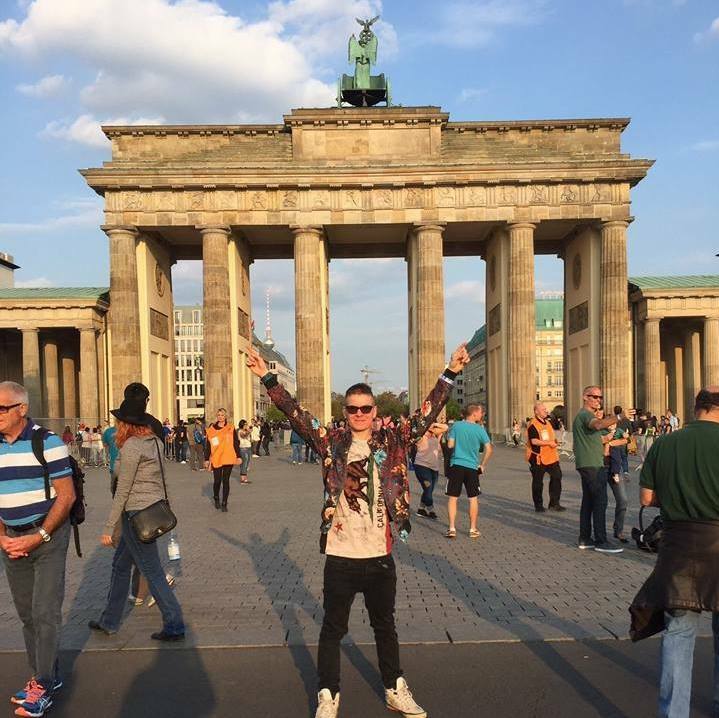 That said, I do have a place in the Berlin Marathon at the end of September, and I will be training hard so as to hopefully improve my time.